They are free swimming animals that use their pulsing jelly-like bell to move and use their trailing tentacles to capture prey. Jellyfish are the oldest multi-organ animal, roaming the seas for over 700 million years. Jellyfish are found in every ocean around the world and prefer to live in coastal areas. Some jellyfish are harmless to humans but others have venom that can be very deadly. The box jellyfish is one of the most venomous animals on the planet! Although fatalities are rare due to anti-venoms and treatments available, a box jellyfish sting has the potential to cause a heart attack and death within 5 minutes! 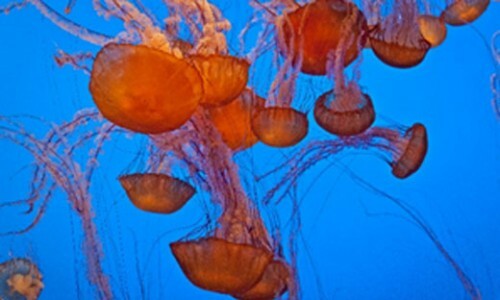 A group of jellyfish is called a “bloom” and sometimes, unofficially, a “smack”. Jellyfish are approximately 95-98% water and have no eyes, ears, mouth, heart or a brain and have no bones/spine making them invertebrates. They do not require a heart or lungs because their skin is so thin oxygen can pass easily through into their body. This is known as diffusion. They also do not need a brain and eyes as they have a set of nerves on each tentacle that detect things such as touch and temperature and cells sensitive to light. The jellyfish then responds to these stimuli like a reflex and orient (position) themselves accordingly. Jellyfish are carnivorous and feed on plankton (small organisms that live in water), small fish, crustaceans and sometimes other jellyfish species.